In return, Grybauskaitė slammed the prime minister’s proposal on the Belarus plant conversion as «anti-constitutional» and underscored that some of his foreign policy decisions were causing international embarrassment for Lithuania. Skvernelis however shot back, saying that all these statements show that Grybauskaitė is taking part in the election campaign. His new pledges, to move Lithuanian embassy to Jerusalem and hammer out a «strategic partnership» with Japan and court China, has put him back in the limelight. Amid a new wave of criticism, the prime minister is resilient: «…we cannot deny Jerusalem’s importance to the Israeli state, but we cannot not to hear the United States’ motives when it recognised Jerusalem as the capital. I’d see no tragedy if we returned to the issue and considered possibilities for moving our embassy to Jerusalem,» he said. He insisted that Lithuania should not be afraid to stand out among neighbouring countries. «The biggest pro following the decision would be a new impetus to relations with Israel, and that would cover our security issues, and also trade and economic issues. We all realise those close ties between Israel and the United States. I think we would have easier cooperation and understanding in bilateral relations with the US, and that would be a signal that the US is our partner not only through words but even in such serious discussions we are taking one or the other side,» Skvernelis reasoned. When speaking of his plans in Asia, he said that Japan «can be and must» become Lithuania’s key partner. Speaking of China, he said that Lithuanian businesses are interested in China’s economy, and Lithuania needs to consider our pragmatic interests and the state’s interests. In a nod to China, the PM met this Wednesday with Chinese ambassador in Vilnius to address the West’s growing tensions with Beijing over Huawei. Concerns in Lithuania are raised because Huawei equipment is used by telecommunication company Telia Lietuva which is developing the 5G network, and questions are also being raised on the use of the Huawei technology by the public sector. Notably, Lithuania’s intelligence has recently pinpointed to China as threat to Lithuania’s national interests. Is premier back-pedalling on the official position on the East’s giant? «With the time ticking away, he is eager to turn things around and catch up with Šimonytė. I believe his short-term goal is to overtake her and, along with Nausėda, make it to the second round of the elections on May 26,» Vytautas Dumbliauskas, associate professor at Mykolas Romeris University, told Baltic News Network (BNN). Agreeing, Liutauras Gudzinskas, lecturer at the Institute of International Relations and Political Sciences at Vilnius University, told BNN that some of Skvernelis statements on Lithuania’s foreign politics, specifically the proposal regarding move of embassy in Tel Aviv, «stir confusion and understandable exasperation» of president Grybauskaitė. «She is the one who is primarily responsible for foreign policies. 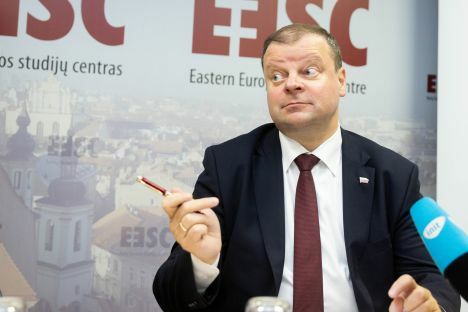 Skvernelis’ resolve to draw a difference between Grybauskaitė foreign policies and those of his own are seemingly backfiring against him so far. Confronting popular Grybauskaitė, he is playing with fire,» Gudzinskas said. If elected to Office, Skvernelis also said he will seek to bolster ties with the United States. «I find US investment into the expansion of the Klaipeda port important, and we need closer cooperation with the US defence industry. Long-term supply of LNG to the port of Klaipėda would be a good example. We cannot turn our back during important UN votes. I have in mind the Jerusalem issue,» he recalled Lithuania’s voting in the United Nations General Assembly. In late 2017, in the UN General Assembly’s vote a non-binding resolution rejecting the decision by US president Donald Trump to move the US embassy to Israel from Tel Aviv to Jerusalem Lithuania voted against the US position, whereas Latvia and Estonia abstained. «We have to take advantage of its growing economy as Poland has the largest NATO army in this region, and it’s important to coordinate positions on the defensibility of the Suwalki Corridor, and to cooperate within Poland’s initiatives on the US’s presence and bolstering air defence. I hope we will never return to those times when we failed to hear each other,» he said. When addressing Baltic unity and competition, after noting that the Baltic nations are very close culturally, emotionally and historically, there were decisions that, according to Skvernelis, could have been different. «For example, the LNG terminal… and there’s also no decision on the sea border with Latvia….and we have also had many discussions on the synchronisation of power networks,» he said. «But in terms of the protection of our national interests, cooperation between individual officials is possible, not in the name of good relations but for specific solutions, having in mind challenges related to the joint border, smuggling, illegal migration, as we have with Belarus,» Skvernelis said. «The ball is on the Russian side…And if the neighbouring country wants to improve relations or to have constructive, at least minimal, relations, then there should be some positive signal from that side. There hasn’t been any so far,» he added. Speaking of the presidential election, in full swing now, Ieva Petronytė-Urbonavičienė, assistant professor of the Department of Political Behaviour and Institutions of the Institute of International Relations and Political Science at Vilnius University, called it «very interesting». «It is just too early to say that winner is known already,» she told BNN, commenting on the 8 percent lead in the polls by frontrunner Nausėda. «Although much yet depends on the performance during the last weeks until the elections – what new and catchy electoral promises and messages will be conveyed to the public, to what fishing expeditions the candidates can be exposed, etc.– it is evident that Nausėda, Šimonytė and Skvernelis stand the best chances of making into the election’s second round,» she said. «All the candidates have room for boosting their electorates by sending out some interesting messages during the last weeks before the elections. However, it is Saulius Skvernelis, who as the prime minister, can send them loudest,» the analysts emphasised.